And that’s a wrap!! We did it! 18 participants, 10 different countries, divided into 4 teams working to solve “wicked problems” for 4 local organizations through the Innovating for Employment Success Workshop with MosaicBC. Next week, the City of Vancouver, Zaber Technologies, and Camp Pacific will get to see the amazing work these guys did, innovating solutions that came through learning and doing service design in just under 9 days. A set of innovative solution recommendations which will that create the most impact and value for all the stakeholder groups involved from services to products/tools. from business/employees to the customers/users. I’m fortunate to have this opportunity to custom build yet another workshop curriculum for a targetted audience group, then facilitating the hands-on experiential learning. 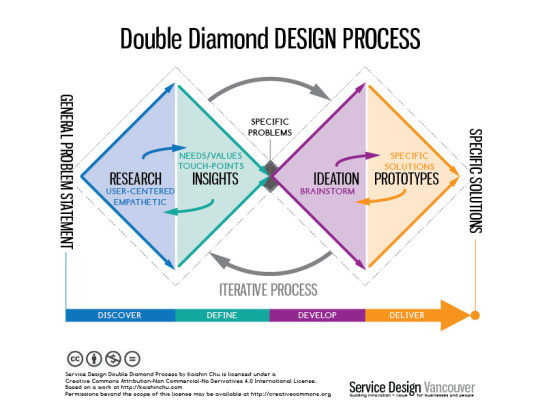 The content is rooted in learning the service design methodology via the Double Diamond Design Process framework, which is a combination of the general DD design process out there and my own design process expertise. We all worked together, many faced deeper human relation challenges that was brought on by language/cultural/personality barriers, as well one’s hardwired beliefs, such as over analytical or impatience to solve the problem based on self knowledge instead of letting the insights in discovery provide the solutions. In the end we saw participants experience transformational realizations on just how much more valuable and impactful the solutions they can come up with when applying service design with a vetted methodology, while getting invaluable mentorship on how to do it well, as well as having an impact on both professional to personal perspectives. It’s been a very rewarding experience yet again. An honor to work with such highly educated and a very international group. As always, it has been an honor to teach, facilitate and mentor. Thank you to all of the participants for providing me with so much more experiences as a service design consultant and educator/facilitator. I look forward to seeing you at your presentations and for the wrap party next month! And cheers to MosaicBC and Envisioning Labs for having sought me out to be part of the project. Also thank you to the ministry of innovations for supporting our collective endeavours!